Another popular model from UPPAbaby is Cruz. While having a lot of the features of the full size stroller, it’s lighter, has smaller footprint, and a more compact fold. This model is somewhere in between a Vista and G-Luxe. On one hand it has a reversible roomy seat with a large canopy like Vista model, but on the other hand the wheels are much smaller. The good news is that while you will definitely need to buy a lighter stroller if you have Vista, with Cruz model it could be your ONLY stroller. For 2018 they’ve only added real weather handle bar and bumper bar to all of the colors and added new colors. That’s it. Everything else stayed the same. It still has a roomy seat, adjustable handle bar, huge canopy with pop-out sunvisor, included swing-away bumper bar, adjustable leg rest, huge basket, one-hand lever recline, and intuitive easy fold. You can convert it into a travel system by replacing the seat with an infant car seat or a pram by replacing it with a bassinet (sold separately). It works with popular car seats like UPPAbaby Mesa, Maxi-Cosi, Nuna, and Cybex. It comes in seven beautiful colors and can be purchased for around $499 depending on the color. As you know I am a big fan of UPPAbaby because of its stylish and high quality products. So it’s not surprising Cruz 2018 model has made it to my ‘Top 20 Best Strollers‘ list the second year in a row. -Great canopy. Just like on previous models the canopy provides plenty of shade. New redesigned pop-out sunvisor is made out of woven fabric that won’t wrinkle as much, but it’s still UPF 50+. It drops down all the way to the bumper bar shielding your child from harmful UV rays. The canopy locks nicely in place when you slide it up and down to accommodate your growing child. I really like the ability to adjust the canopy up and down on the frame. Not many strollers have that option. -Adjustable handle bar. It is a telescoping handle bar that can be easily adjusted by pressing a button in the middle of the handle and pulling it out. It extends from 40″ up to 43″ from the ground. Great for shorter and taller parents. It has a real leather cover that is REACH certified meeting EU requirements for chemical testing. -Roomy seat. The seat is 12″ wide with 20″ seat back and a measurement of 20″ – 22″ from the bottom of the seat to the top of the canopy. The canopy slides up and down the frame so you can get 2″ more inches to accommodate an older child. It has a deep one-hand lever recline with 5 positions including a flat one that is suitable for newborn. I would recommend getting an infant insert for better support. I absolutely love how upright seat is! A lot of kids, like my daughter Sophia, hate to be reclined and want to sit upright with unobstructed view. The seat material is easily removable and can be machine washed! The seat can accommodate a child from birth and up to 50 lbs. -Reversible seat. The seat is reversible so you child can face you or the world. All you need to do is push two buttons on both of the sides of the seat, swing it around, and plug it back in. It has the same recline positions in parent-facing mdoe, but you have to switch it back in order to fold the stroller. -5 point harness. It has adjustable padded 5 point harness with a center release button. The button is very easy to unlock (your 2 year-old will be able to escape). The buckle is very easy to lock together and it’s NOT a puzzle piece like on many other strollers. -Bumper bar. INCLUDED! It’s a swing-away removable bumper bar that is covered with real leather on all the colors. -Premium materials. I wanted to say a few words about textiles and leather accents. As I’ve mentioned above, for 2018 all of the colors come with real leather covered handle bar and bumper bar. It’s 100% full-grain leather that offers far more breathability, flexibility and durability than any faux leather on the market such as vinyl, vegan or “protein” leathers. The leather on the handlebar is hand sewn and given a perforated pattern for extra grip while pushing baby. The bumper bar leather is embossed for added resiliency which makes it easy to clean. Also, on Gregory color you can find premium fabrics that are made out of revolutionary weaving technique blends which are soft and comfortable yet still robust. For older models you have an option of purchasing a zip-on leather bumper bar and handle bar. They easily zip over existing bars on Vista and Cruz. -Adjustable foot rest. The are two foot rests: one is part of the seat for smaller babies and another one is a part of the frame for older children. The seat leg rest is 10″ high and is adjustable. The frame foot rest is not adjustable. -Large basket. I LOVE this x-large basket! It is very easy to access from the back and you can load it up to 25 lbs. Your largest diaper bag will fit without a problem. -Wheels. The 2018 Cruz rolls on four solid polyurethane wheels that mimic air-filled tires, but will never go flat. It has 6.5″ front wheels and 8.25″ rear wheels. The front wheels are swivel, but can be locked straight for rougher terrain. These are medium size wheels that can handle some mommy terrain like grass or playground mulch, but don’t plan on going off road with it. -Parking brake. The is a one-step parking brake located in between rear wheels. It is a flip-flop friendly pedal that is easy to lock and unlock without scratching your shoes. -Easy fold. It’s a two-hand two-step fold although they are saying it is one-step fold on the web site. I guess it is one step if your seat and the canopy are in the right position and is facing forward. First, make sure the seat is facing forward and is in upright position. Next, pull two levers located on both sides of the handle bar and fold the stroller in half. That’s it! You can also take the seat off before folding. It does have an automatic lock and a standing fold. The Cruz is not very compact stroller with folded dimensions of 22.3”W x 17”L x 36”H (with the seat attached). I think that the bulkiness is the BIGGEST con of this stroller because a lot of other strollers with even bigger wheels have a much more compact fold. -Travel system option. You can convert it into a travel system by replacing the seat with an infant car seat. 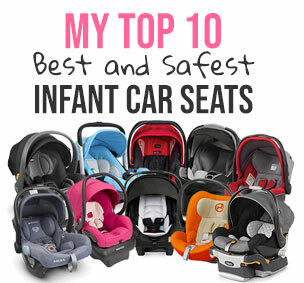 It works with popular car seats like UPPAbaby Mesa, Maxi-Cosi, Nuna, and Cybex. -Bassinet option. It plugs right in to the frame instead of the seat. I am absolutely in LOVE with this bassinet. I think I can write a whole review just about this bassinet. Don’t worry , I will try to contain myself. The bassinet weighs 8.4 lbs and is designed for a baby from birth and up to 20 lbs. The cool thing about this bassinet is that it’s deep enough for you to use at home for overnight sleeping. Great extra bed for your baby! The large canopy unzips in the back exposing a dark mesh that allows for better air flow. While keeping your baby cool and comfortable, the dark mesh also provides sun protection. To provide your baby with even more sun protection there is a large pop-out SPF 50+ sunvisor that has been upgraded for 2017 and now is made out of better quality wrinkle-resistant material. Just like on the seat, the sunvisor locks in place much better than before. -Infant SungSeat option. If you want to use Cruz from birth but don’t want to buy the bassinet, you can get an Infat Snug Seat which goes into a fully recline seat and can be used from birth. This insert provides extra comfort and stability for your baby’s neck and back. -Bulky. The fold on Cruz is a little bulkier than I would like for a lightweight stroller. -No suspension. Unlike Vista that has all-wheel suspension Cruz has no suspension. Here is a video overview of 2018 model. The UPPAbaby Cruz is available in eight different colors: Jake, Denny, Taylor, Emmett, Jordan, Gregory, Loic, Taylor, and Sabrina. While most of the models have silver frame, Jake come with the black one. You can get UPPAbaby Cruz 2018 in one of the eight beautiful colors for around $499 (free shipping) depending on the color. It comes with a bumper bar. You can also convert it into a pram with a purchase of a bassinet. I’m comparing the Uppababy Cruz to the Baby Jogger City Mini GT. I like that the Cruz has the reversible seat, but I like the smooth ride of the City Mini GT. Any insight? What do you recommend? We live in the suburbs and I really only want one stroller–to run errands, to go for walks around the neighborhood, to go to the park, etc. I disagree about not using the reversible seat after a year. My son is 16 months and doesn’t like to face out if he’s napping. He won’t go to sleep unless he’s facing inward. Also we travel abroad often mostly to Asia and I like that I can have him facing me when on the super crowded city streets. He feels much more protected and I feel that it is safer. Especially because so many people still smoke in Asia, especially in the crowded shopping districts. Someone brushed me with a lit cigarette in a crowd last time. I think as always, it depends obviously on your child and lifestyle. We had the G Luxe for travel and it was a disaster. Between the wheels, forced recline, facing out only and lack of safety strap. It was an unpleasant experience to use in Hong Kong. My son wouldn’t even go into after the first day of our 2 week stay. I just bought an Uppababy Cruz as my travel stroller because my Bugaboo Buffalo that I use at my house in the suburbs is a behemoth and too expensive to travel with. Just my two cents. I really love the new look and designs of the 2017 Cruz. I am debating between the new Cruz 2017 or the city mini gt. I love that the crus has reversable seat and a large basket and that I have the option of the snug seat. I like the city mini gt mainly because of the fold, be since in the beggining I need to attach a car seat I’m wondering to just wait and get the lighter city jogger in the future as my car and traveling stroller. I live in the city but I go to the suburbs on weekends to see my family, so I need something I can walk a lot in, but not struggle to put in the car. Which stroller should I go with? Any tips? I’ve been comparing those two as well. Although with your new 2017 review, there are others to consider too! I’ve read that the GT has some concerns with tipping and you cannot hang a diaper bag on it. In addition, the basket it small. Other than those issues, it seems to be very user friendly and terrain friendly. Any comments on those concerns? Thank you! And thanks for all you do to help clear the muddy waters of stroller buying!! I bought this stroller and I’m not too happy with it. When I push the stroller on many different smooth floors the strollers shakes. It seems like a wheel is loose but they aren’t. For the price of the stroller I wouldn’t it expect it to ride like this. Hoy aré wheels in the new cruz 2017? What would be your pick between the Nuna Tavo and the Uppababy Cruz? 3 – handle gets twisted, tends to slide in when being pushed hard. 5 – if you want to lift a stroller holding by the seat bar it may not hold, especially when you put something in the bottom basket.. I, obviously, do not recommend lifting with the baby in the seat – the bar will certainly break apart. 6 – generally, build quality is so so..
3 – works well with bassinet and car seat. I’m looking into buying a cruz. My old vista had extremely durable fabric. I’m looking at photos of the cruz and it seems like they have switched to that soft memory foam-esque fabric that snags really easily. Is that true or do the pictures just make it look that way? Hi Susan, this is a very comprehensive review – thank you! My only concern about the Cruz is that the basket doesn’t recline flat like many other strollers. I wonder if it makes a difference for kiddos while they are napping to have their knees bent instead of being able to straighten out or shift when they are a bit bigger. Any thoughts on that? thanks! Hi Vanessa. I guess you mean the seat and not the basket. I agree that a flat recline is more comfortable for a child during nap time. The always-sitting position is not my favorite. But most luxury strollers have that V shaped seats. My friend passed her stroller to me and I’d like to know if I can put the seat in the washer. It feels like it has a hard wood seat it is it a hard plastic seat. Hi! I cant decide between the Babyzen yoyo and the UB Cruz, i only want to buy one stroller for my first baby so , im thinking to buy a lightweight stroller with a carseat for infant for the first few months of the baby. I like the lightweight of the YOYO but i cant use it without the carseat until the baby is 6 months and i dont want to buy their bassinet, another thing is the i found that the yoto doesnt look as stylish as the Uppababy, for the price a i think looks cheaper than it is. So im thinking about de CRUZ, beacuae ita not as heavy and bulky as the Vista, you can buy the Mesa car seat an dont need extra adapter, y if you recline the seat you can put your baby from birth with the snugseat. So what you think i should do? Would you get a cruz or a balios S? I have a few stairs leading up to my house and wondering how hard this stroller will be to drag up? I already have the babyzen Yoyo which is great, but wanted a stroller with bigger recline for when we are out for a long time at grandmas for example. Do you think it would be quite repetitive? Thabk you for your helpful article. I have a taller baby and will be traveling domestically and internationally. I need a everyday functional stroller that can get me through the uneven surfaces on the city pavement, going to the park, shopping, and even to take in and out of a taxi. I am comparing 2018 Uppababy Cruz and the Cameleon and need some help with this. Do you have any suggestions for me?